Could Zeta explain what this new crop circle created in Wilton Windmill, nr Wilton, Wiltshire means? Upon examining this crop circle, one will find that the 12 sections never have a line-notch that matches a line-notch on another section. There is no continuity, from one section to another, in these notches. What do the 12 sections represent, and what do the notches represent? Since the Gregorian calendar is universal, we confirm that it is months. The notches represent significant seismic activity, or plate movement. This tends to get hot in one area, and then the stage moves to another area. We are not yet at the point, as will be the case certainly during the pole shift and may be the case during an 8 of 10, where significant plate movement in one area does not start and stop, but just keeps going. Rock fingers are still holding the plates in their current positions, in the main, so there is some movement and then a halt as new catch points take hold. As to whether this crop circle, showing 12 month slices, indicates we have a year of this type of halting plate movement to anticipate, realize that this circle could represent months past, or even a year of past activity. We are certain that there will be a flurry of analysis, thus, on just what pie slice is what month, and just what notch is what earthquake or stretch zone movement. But we predict that no timeline clues will be able to be discerned with certainty from this crop circle. Can the Zetas explain the difference between Moon Swirls of Planet X and the Planet X itself? Apparently they are similar. Why is there such confusion? There are images from SOHO, which apparently is a reflection on them a genuine body of Planet X? Or is it the same moon swirls? They are similar in appearance because of the charged dust cloud which they all share. The light you see, whether from Planet X or a Moon Swirl, is light reflected off the dust. Moons Swirls which show up as a check mark, minor swirls coming off a major moon, are likewise from the dust, though the check mark appears as a line. Even though small, these minor Moon Swirls have coalesced charged dust around them, and thus this is still only light reflected from the dust. 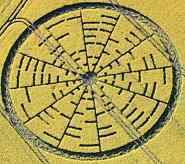 This crop circle is a simplistic reminder of the magnetic trimesters, where Secklendorf was complex. Secklendorf included major Earth change notches, and the positions of those planets caught in the cup - Venus, Earth, and the Dark Twin. There is endless speculation among those hungry for a timeline clue, as to how the present and past line up, so a timeline to the future can be grasped. But since the planets and notches do not come with labels, this has proved to be an elusive conclusion. By the time Secklendorf is understood with certainty, mankind will be well on its way to being in the 8 of 10 scale point, and the issue will be moot. I'm very appreciate that Zeta has given us the specific and excellent answers about the future safe places in China . But it is known that there are some dormant volcanos in mainland China, especiallly in northeast China, such as those in Heilongjiang province. Lots of Chinese are worried about that these volcanos will erupt during the poleshift or after the poleshift, jeopardizing those who have migrated there . Besides the problem of volcanos, northeast China has a relatively low elevation above sea level, and is close to Russian territory, which is easy to be flooded during and after the poleshift. So my question is, will China be overshadowed by volcanos and northeast China be flooded by tidal waves indeed? Where Heilongjiang Province will have the rising sea water at their doorsteps within 2 years after the pole shift, this province is on solid land and forms a solid land bridge to lands to the north, all the way to the Bearing Straits. Mongolia will not be flooded, so fears that flooding from the north, from Russian territory, are also unfounded. Inactive volcanoes in this region are less likely to erupt because the area is not subject to subduction or pressure as the Eurasian Plate will rip up through Pakistan and into Russia prior to the compression in the Pacific will start to become intense during the hour of the pole shift. I thought this was a hoax, until a detailed report of it, by the weatherspace.com, was added to this ning. http://poleshift.ning.com/profiles/blogs/canadian-spiral So apparently there is a video feed of this "event" and pictures of it, both taken from different angles, and there are multiple witnesses as well. Doesn't seem so fake now, it seems. any comments? This crudely done hoax did not fool many, and not for long. The video looked nothing like the stills. There was no rationale for having a video camcorder or camera pointing at the sky at that particular moment, held perfectly still and pointing at the sky in the middle of nowhere. Where were the gasps, the shaking hand, then sudden rush to zoom in. Other than the hoaxer's stated reason, to test gullibility, what was the reason for the hoax? At a time when so many signs in the skies are appearing, genuine signs like the Norway spiral and holographic triangular UFOs, the establishment is searching for ways to confuse the populace. He was not running a gullibility test, he was delivering a product to employers! What can be expected regarding immigration restrictions between Canada and the U.S. in the coming months and especially the final weeks? Should U.S. citizens with valid immigration papers living in Canada anticipate being suddenly deported? Alternatively, is it likely the U.S. will close it's borders to U.S. citizens trying to cross over from Canada? Although this is in the hands of man, we anticipate no significant change in immigration rules between these two friendly neighbors until the last weeks, when panic will grip officials. However, even then the very leaky border between these two giant countries will afford a means of passage, in either direction, as it does today. Today, immigration violation is discovered after the violation, because someone is looking for work or to rent a room or needs health care and does not have proper ID. In the last weeks, this will not be the concern. Greetings from Austria! 100 years after the pole shift, it is unlikely there will be any humans left. I have decided to go along with people of my home town and help as I can. But many friends say, they would prefer to die if circumstances are that uncomfortable after the pole shift. What makes the big difference if humans die out in a moment or within 100 years? Can you bring it to the point, why it is so important to live some more time under inconvenient conditions? A good example for motivation? [and from another] Why did Gandhi give up life as a lawyer, to help free a group of people, or Martin Luther King, stand up as a pastor and fight for civil rights, or Mandela stand up for South Africans? You get the point. Someone who says they would not want to live, when presented with the grim picture painted of life after the pole shift when modern day conveniences are gone and hard work goes into every meal on the table, is thinking first and foremost about themselves, without a thought of what others might need. We have stated that there are those who realize they will be a burden on others, and many aged or infirm who lose the will to live and die are doing so during the current time because they sense what is on the horizon. This is not selfish, because they don't want to live in hard times, as there is little they could do to assist others, and would be a worry to others already overburdened. But we have stated that for a hale and/or young person to make such a statement is selfish, and thoughts of suicide selfish too in this situation, because the thought should be to how many orphans and injured there will be that need them, need their assistance. If you think such a comment, "why live" is made in a flippant manner and not the real orientation of the individual then respond with "are you the only one who counts?" to make them ponder this. They will either get serious and start talking about the impact on others, or continue to be focused on how their precious life will change. This is not something in your control, as it spins off their basic spiritual orientation. For the sake of Our Worlds Oceans can you tell us how best to stop or curtail the Oil, considering its devastating impact once it enters the Loop Current, rounds Florida then feeds into Gulf Stream, then north into the North Atlantic Drift, feeding Norwegian and Canary Currents, and Equitorial Current and Counter Currents thus into the South Atlantic and possibly South Indian, Western Australia and South Equatorial and African Currents. See Map of Oceanic currents: http://en.wikipedia.org/wiki/File:Corrientes-oceanicas.gif [and from another] Experts say that the drilling rig Atlantis is set to cause a much bigger problem that would add to the oil spill in the Gulf. Do the Zetas see any repeats of this disaster making it worse? [and from another] I am very concerned for human and animal life in the Gulf of Mexico. The mix of crude oil, dissipants and Benzyne are extremely lethal. Soon will be hurricane season and the rains will wash all these toxins inland for hundreds of miles! The Zeta's seem "nonchalant" about the devestation and ongoing pollution. Will or are the Zeta's assisting? What about dumping barges of gravel till the "oil volcano" is covered over by 100' of rock?? Certainly this single oil spill is not going to flow around the world via every possible route. How much oil do you presume is in this particular pocket? Is the N American continent afloat on a giant pool of oil, just now discovered by a BP puncture in the Gulf of Mexico? Such panic and speculation is not called for. The avenues by which man can stop this particular pool, which is under pressure as we stated from the N American continent being pulled into a bow, are known. There are hundreds of suggestions, as for many the problem seems simple, just plug the darn hole. But those who have worked in the industry know the variables and by experience know what works and what does not work. The junk shot, which is being implemented at present, is not gravel, which cannot stop a flow as it is not a seal, but material known to create a plug that will not leak. We could add no suggestion that man has not already considered. Benign aliens of course would have other options, if allowed to intervene, which they are not allowed to do due to the Rule of Non-Interference. For those who think our alarm too casual, we would point out that today devastation happens and aliens do not intervene - bombing Japan with the first atomic bomb, the massacres in Africa by machete, kidnapping and sexual slavery of children all around the world. Exceptions will not be made just because you are horrified by a disaster or might be impacted. Nor will the impact of the coming pole shift be eased. Compare the current BP disaster to what the pole shift will bring, to gauge our alarm. We have our focus on the ball, as you say, our eye on the ball. The BP oil spill is not the disaster you should be wringing your hands about. In ZetaTalk descriptions we often see the soul and human (personality) as two individuals within the same body, each with their own agendas, so to speak, acting as separate subjects, often disagreeing, the soul not treating the human as an equal party, often reluctant to share everything it knows with human, and human often rebellious and reluctant to go along with the agenda the soul tries to muster. So, our "sense of the self" - does it "belong" to our soul or our temporary incarnation? People report that in NDE it was them, their consciousness, that was experiencing this, floating out of body and observing from aside. It couldn't be the mind of incarnated human experiencing this, as the mind was in coma along with the rest of the body. But they retained the same day-to-day self awareness, "sense of the self", - they remained themselves! When the soul speaks to the mind, the physical brain of the human it incarnates, or to the brain of others it wishes to speak to while a ghost, it must translate. It paints a picture, via brain chemistry, of what it encountered during a Near Death Experience, showing the physical form of loved ones remembered. They were waiting at the end of a tunnel of light, for instance, and there was Uncle Joe as he was recalled to look when alive in the past. This is not what the soul encountered, when encountering the spirit that had been incarnated into Uncle Joe, but how to make the human brain understand other than to paint such a picture. This is likewise done when a ghost tries to relay why it is hanging around. "I was a little boy who was sodomized and murdered here, the guilty still unpunished" may be the message, but how to relay this to other humans who might solve the crime and bring the soul that had been incarnated in the child some peace? Those seeing the ghost glimpse a little boy, or get other such clues, as the spirit ghosting is using the brain chemistry of the human experiencing a haunting. Does this spirit incarnate the body experiencing the haunting to accomplish this? In a manner of speaking, by working in partnership with the soul incarnating that body, in partnership with another spirit which is sympathetic and willing to share. The human incarnated also perceives the life they are living as "their" life, not the life of some spiritual entity living within it, the incarnating soul. Just as when recalling a Near Death Experience they think they saw Uncle Joe, they perceive all their actions as being a decision on the human brain, based on a conglomeration of experiences they have had as that human incarnation alone, perhaps genetics or some other impetus for action and decisions have played a part. The incarnating soul is such an influence, as much as drugs or genetics or experiences, but cannot be seen or measured so is not taken into consideration by the human brain. Thus the perception by the human brain that the soul has no influence, and is a thing apart. The many hints that people "from the sea" were an issue during this time is a certain clue that piracy had developed. Since iron withstands penetration from a spear or arrow better than bronze, this was also a natural impetus to move from the Bronze Age into the Iron Age. Cultures and societies also have a natural cycle. If new, there is necessarily a strength in leadership or the new culture or city-state would not be growing. But as with corporations that flourish at first under the leadership that started them, when that leadership dies or changes hands, what follows from the second in command is not necessarily strong, and most often is quite weak. Weak leadership clusters around strong leaders, like mushrooms around a great tree that has fallen, as they feed off what has been established and hope for reflected glory or a status based on association. The rise and fall of great civilizations have many reasons, but this factor should be considered when looking for why piracy became prevalent during this time. Did the NWO Cabal get crystallized in connection with the planning of the Federal Reserve? Was the Rockefeller Foundation the HQ and primus motor behind the NWO-movement in its first years? http://en.wikipedia.org/wiki/Rockefeller_Foundation [and from another] The leaks out of the Trilateral Commission Meetings in Ireland in the lead up to the Bilderberg Meetings in Spain, indicate that the powerful are quite discouraged that nationalism and other political positions are defeating the plans for a UN tax system and a one world government. What do the Zetas see as their plans for the future? Are they discussing Pole Shift in small groups and making preparations? Do they understand a dimensional shift, have they discussed it, and what do they make of it. I would think they would like the 3rd D to continue as long as possible because from that they obtain their wealth and power and are not eager to give it up? We have mentioned that the banking industry is the primary impetus for establishing a New World Order, but this involved more than establishing a world banking system to avoid the distress of currency fluctuations. It is no surprise that the World Bank emerged, trying to tie emerging countries into debt in order to control them. It is no surprise that the World Bank has had leadership appointed by the US, which itself is in debt to those who fund the Federal Reserve. It is no surprise, in this day and age when the banking industry is trying desperately to claim they are sound and solid and not a house built on shifting and sinking sand, that talk of an international currency or single banking regulator is emerging. If they have only one voice, then so much better to silence the truth. If they have only one currency, then how much better to cover the fact that this or that country's banking system is floundering. The false paper promise can remain unchallenged. These types of maneuvers have floundered, in the past, and will run into even more obstacles in the short period between the present and the pole shift. Everyone is looking for their best advantage, and when times become economically troubled everyone bargaining wants more in the bargain, when there is less to give from any party. Endless arguments, very little cooperation and mergers resulting. We have stated that paper money or assets such as stocks and bonds will be worthless by the time of the pole shift, except in certain wealthy enclaves and then only for a short time. Those advocating a New World Order will be left squawking their advocacy to those who no longer want to listen. The Zetas say that they have taken the unselfish people off flights before they crash, where the bodies would not be recovered. So, when India slides under the Himalayas, will the Zetas remove the unselfish as that happens? And in Indonesia, and western Australia, and all the other places where the catastrophe is so extreme? And let us say the total number is 400 million, where will they put them? Is there any truth that a new planet has been built, created, or moved, for the huge numbers of people to live on while the tribulation goes on? fill a necessary or highly important role during the Transformation. Beyond stating that Nancy is one such person, due to her international fame and familiar voice and face, we decline to identify this criteria or such individuals further. Do the Zetas plan to cleanse the Earth of all the Genetically Modified Plants such as Con Agra and Monsanto have created leading up to the pole shift, or can and will they be left behind in the shift to 4th D? Beyond the fact that some genetically modified plants have the terminator gene, and thus cannot perpetuate themselves in the wild, is the issue of those plants which can reproduce but have functioned like some kind of Frankenstein Monster, a combination of animal and plant genes or other such horrors. Accused of increasing allergies and having other unknown consequences, produce from such plants have been banned from many countries. Will such plants thrive in the Aftertime, and plague survivors? What the Aftertime presents to plants and animals is a challenge at best, as the climate changes, careful tending by farmers is sporadic, and insect repellant is no longer a handy assist. Thus, those plants and animals which have evolved over the eons and met such challenges do best. Weeds will thrive, and genetically modifed plants will disappear quickly from the landscape. This is our prediction. 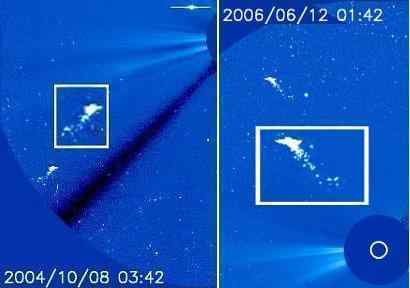 This Planet X image on SOHO is taken on May 23, 2010. It seems that it is getting a lot more bigger .But I'm wondering that the Planet X images on SOHO have usually wafting tail behind it, its moons swirls can also be seen on images. Why does it have no any sign of its tail and moons swirls this time? Is it a genuine Planet X SOHO image or just pasted by NASA to confuse all of us and a fake one? 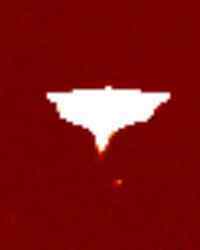 In an attempt to deflect the fascination with the evidence that Planet X is in the inner solar system and showing up on SOHO images, NASA has tried on occasion to display what the SOHO camera captures with less clarity. Times when a single pixel or group of pixels receives an overload and appears white against the surrounding image are not unknown, and thus they could claim that this was what people were seeing. This effort obviously failed, as the Winged Globe is distinct in appearance and Moon Swirls do not form rectangles or squares. The Kolbrin describes at least three different passages of the Destroyer. In all three passages there is the description of thunderous ear shattering noise during the event of the passage, followed by silence, complete utter silence. Then the men went mad and became very violent. At first I considered this madness to be the result of having their lives completely upended. I've already purchased lots of ear plugs for people to wear to try to protect their ears from the noise. And I thought mental preparation would help with the shock. However, these descriptions continue to stay with me, as if I am missing something. My question to you is related to this pattern of madness. Would you clarify the cause of this violent madness, and if allowed, point us in the direction of what we may need to do to prepare for this potential? Of course a "sudden silence" does not occur during the tumultuous last weeks and pole shift hour. The Earth moans in agony as the core wants to continue to turn, to rotate, while the crust is holding it back. What is a thunder clap, but the astmosphere clapping when a void is created between air masses by the passage of lightning. Lighting will be continuous or at least frequent during the last weeks at times, and the thunder claps burdensome. But beyond these known sources of noise, what would create temporarily deafness in a populace? The last weeks are described in folklore or prophesied as being accompanied by trumpets, blasts of a horn. Of course, the human animal perceives sound because of air mass changes. What is the noise from a trumpet but a blast of air, vibrating at a certain frequency that humans have come to associate with a trumpet. The near presence during the last weeks, when the Earth is in such a magnetic grip that rotation slows to a stop and the Earth is drawn closer to Planet X by almost 30 million miles, does more than present a show to those on Earth watching in fascination and horror. If thunder claps are due to lightning traveling to the Earth's surface, what of the lightning in the upper atmosphere which we have described, which moves from the Earth to Planet X? Mankind is not familiar with thunderclaps in the upper atmosphere, although man is aware that lightning does occur up there. Due to the extreme friction caused by the wafting charged tail of Planet X, lightning discharge is humongous, with massive crackling discharge leaving the Earth's upper atmosphere. This creates voids in the upper atmosphere, which clap, causing vibration in the lower atmosphere where such vibration is interpreted by mankind as trumpets or horns. And on occasion, such loud claps cause temporarily deafness in those subject to this noise. Could the Zetas please advise how to sharpen one's intuition? It seems humans will need to rely on intuition more and more as traditional sources of information become limited or unavailable after the pole shift - the media for news, healthcare professionals for medical diagnoses and medications, schools and teachers for learning how to do new things, etc. We have explained that those who are psychic or have premonitions are using a combination of logical ability, common sense, and telepathy. Intuition is more than this, because one can have intuition about the state of their health, which is based on being attuned to the signals one's own body is giving. 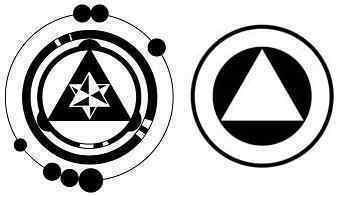 Or one can have intuition about the weather, which is based on observation of what precedes a storm or pressure change. Or one can have intuition about a pending earthquake, which can be based on sensing electromagnetic screeching coming up from the rock or noting the reactions of animals sensitive to this screeching. How to become more intuitive? Just listen! Can the Zetas provide guidance on what can be expected in the US and Canada regarding land ownership and lease agreements in the Aftertime? The Zetas have advised acquiring rural land in preparation for the shift, but I suspect most land titles and lease agreements will be considered null and void following the cataclysms, with Squatters rights more the rule for establishing permanent residence in rural areas. Can the Zetas offer their perspective on the likelihood of prior land titles and lease agreements being honored by survivors in the Aftertime, and how will the settlement and establishment of land ownership in the Aftertime differ from what it is today? Since there will be no governments in place to manage public lands and national parks, assuming the land is habitable and unoccupied, should survivors expect these areas will be readily available to them in the Aftertime? Land rights are likely to prevail up until the hour of the pole shift itself when they will begin to crumble rapidly. This is based on all the factors that are in place for land rights today, and how rapidly these factors will change. Land rights are based on land ownership and contracts if the land is leased. This is supported by the courts, is normally honored by police, and backed by paper records at a Register of Deeds office or contracts in the hands of both parties. In countries where dictatorships prevail or the wealthy elite virtually run matters, this may not be a matter of law but rather the force of the dictator's military enforcing his property rights with brutality, or enforcing the rights of the wealthy elite or his friends by this same brutality. Where large parks exist, they are today plundered of wildlife and home to squatters, periodically ejected, but the official owners do fence or patrol parks or vast uninhabited lands, so in the main large populations do not reside there. Well into the last weeks, this structure is likely to hold in the main, though this depends on many factors such as how desirable, well guarded, remote and difficult to travel to, or how well known the property is. Desirable land close to cities will be the most aggressively sought, with squatters climbing over fences or shooting it out with those defending the property. Then these squatters will have the same problem as more and more refuges from the city, starving and having looted all of worth in the city itself, begin to spread out into the countryside. If an estate is well known, and presumed to be well stocked by its owner, such looters or squatters will arrive early, hoping to beat the pack and setup guarding the perimeter. All such places, are, frankly, to be avoided for these reasons. Be rural, remote, and be in place well before the last weeks settle in and make travel difficult. Government property, likewise, will be guarded and will likely b e guarded even going into the last weeks because for many a pay check is seen as their only means of survival. The military might even be used, where strings are pulled, to guard private property, and certainly will guard military installations. When the pole shift arrives, things change. Those who were employed as guards or soldiers see that the devastation was so much worse than they were told. Shock, depression, and insanity pull them aside, so their posts are no longer filled. Desirable property, wealthy estates or government storehouses, will be suddenly overrun by those waiting to loot. In rural areas, where formal property rights are protected by neighbors as much as by legal right, matters do not collapse as rapidly as near cities or in wealthy enclaves. Country folks value their neighbors, whom they have often known for generations and treat like family. If the land is owned by the wealthy, and leased to a farmer, the farmer is the acknowledge owner. Those who formerly had wealth or political clout will find this meaningless in the Aftertime, if they come to try to take possession. Disputes, in rural areas, will likely be settled by informal councils. Those hale enough to have survived with health and vigor will win the shouting match. Or the consensus of the neighbors will lean in this or that direction. A few weeks ago, the Zetas said that President Obama's reason for opening up oil drilling in the Gulf of Mexico is his hope that new oil will be discovered that will replace foreign oil shipments to the U.S. that are disrupted due to earth changes. The Zetas have also said that the BP oil accident in the Gulf of Mexico in April was triggered by the stress that the North American continent is under as it is pulled into a bow, subjecting the oil trapped between rock layers to increasing pressure until a blowout occurs. The Zetas hint that additional drilling mishaps could occur. President Obama is a wise and cautious executive, and given that future foreign oil shipments might be in jeopardy, his plans for drilling in the Gulf of Mexico seem to make sense on the surface. However, I am confused about one point. The President must know that the Gulf of Mexico is in a region with increasing tectonic plate movement. Why would he call for more oil rigs to be built in such a vulnerable area? There are no good options. What is the option with the happy outcome here? Obama inherited the Iraq War mess, where Bush had already lost because civil war was consuming that country and his "coalition of the willing" was deserting his side at a dead run. The country was not being rebuilt, oil was not being pumped as expected, and Russia and its allies were pressing for influence and contacts from the new Iraq government. The US military was hiding in the Green Zone, and trying to avoid the countryside as much as possible. The US, clearly, was not going to be in control of the Middle East after the pole shift, and thus other options had to be explored. What are those options? Even with invading Venezuela and Canada for their oil production this would not meet the needs of pampered Americans, encouraged for decades to drive bigger and faster cars. In arguments behind closed doors, the options were argued endlessly, alongside of the various possibilities for an outcome from the pole shift. If the pole shift were slight, then infrastructure in American might remain largely intact. Being able to placate the surviving population and keep them subservient to a federal system would then involve plenty of handy oil and gas. And of course the US military endlessly points out that in order to defend borders, all those tanks and choppers and fighter planes must have fuel. What is Obama to say - "never mind all that, we're going to have a severe pole shift and won't need fuel, because the Zetas say so"? We have endlessly explained, the US government is not a dictatorship. Many opinions and many voices come into play. What are the worldwide implications if a nuclear device winds up being the only option left to stop that oil flow? The nuclear option will not be used on the BP Gulf Oil spill, we predict, because the implications are unknown. The geology of the sea bed, a mile down, is not well known. What rock underlies the mucky sea bed, and what way will this rock fracture or crumble? Thus, the potential of opening up an even wider hole exists, one that could not be plugged. This is of course in the hands of man, and thus cannot be predicted accurately, as we so often say. The pocket which is spewing oil at present is not infinite, nor is the pressure going to be continuous in future. It will ease in time, and this easing will allow plugging the hole by the mechanical means already employed to eventually be a success. Zetas said: "Hold the globe with the left hand on the N Pole, the right hand on the S Pole, and turn in opposite directions first this way, then back. The S Pole pulled back by a grab on the Atlantic Rift in the southern hemisphere with the N Pole held rigid has the Indio-Australian Plate plunging under the Himalayas and Africa likewise plunging into the void, East turning to SE. This does more than pull apart the African Rift, it pulls the entire oil rich Middle East into a skew. How is it that all that oil dropped into the cracks in the rock in that region, eons ago, during prior pole shifts? The rock was shattered, during just such torque maneuvers. Thus, where we stated that something would occur to pull victory from the jaws of the Bush/Blair coalition before the pole shift, something that would take the breath out of the body it would be so dramatic and unexpected, this region is ripe to present many surprises to those who would be kings in the Aftertime." Does that mean Iraq's oil fields will catch on fire soon? Certainly at the time of the pole shift, and likely to be in evidence to some degree during any major rolling of the African continent. We hinted that major plate movement would be part of an 8 of 10 stage, and this is when this type of holocaust would likely to start emerging in Iraq. Breaking News: President takes nearly 3 months to have staff reveal crimes now imputed to Obama. http://voices.washingtonpost.com/thefix/white-house/how-the-sestak-job-offer-becam.html Presidential Chief of Staff Rahm Emmanuel had President Bill Clinton offer Senatorial Candidate a position on a 'Presidential Board' if he stayed a congressman and Sestak refused. This is a felony in every state in the country and could qualify as a 'high crime and misdemeanor' under the Presidential impeachment provision of the constitution. The Presidents Obama and Clinton huddled all day in meetings, which republicans characterize as conspirators adjusting their stories. Calls are being made for appointment of special prosecutors to examine the evidence and for discovery under oath. This is politics as usual, taken out of context. Quid pro quo is done all the time- you scratch my back, I scratch yours. Judicial appointments, appointments for family members, voting up or down on a bill depending upon what kind of pork is included - is this not quid pro quo? Is selling your vote legal? What's all that pork that is being attached, if not selling one's vote? Most of this is done not with written demands or written offers but a wink and a nod, because it is either illegal or unethical. It is only when the matter gets frank and money is exchanged is it considered bribery, a matter that can be prosecuted. Why is the White House silent? Bill Clinton has had heart problems, and lack of oxygen during episodes of heart weakness or during surgery can affect the brain. Slick Willie has become Sloppy Willie. What Obama is trying to determine is what actually happened. Sestak may have made demands that were not met, and furious about not getting what he wanted sought revenge in the press. Clinton was sent forth to talk to him, to encourage him to stay on board, but one seldom handicaps an emissary so that they cannot explore the issues. Should Obama throw Clinton to the wolves? Would this be helpful during an election year? Think! This is politics as usual, not something to be concerned about when a pole shift will be knocking at your door soon. Get your priorities straight!